It’s Monday…it’s time for this week’s small pleasures. It was the first week back at work after a three week summer holiday, which was naturally hard, but today is the Wellington Anniversary holiday, so the second week back will be a short one. First up, the weather has been really mixed, with wet and almost chilly weather at the start of the week, and then glorious sunshine at the end of the week. Tuesday saw another beautiful sunset (and yes pink sky at night does mean shepherd’s delight) and Sunday…well see for yourself. Sunday’s picture was taken whilst we were at Gindulgence, a gin festival held in Frank Kitt’s Park. We sat sipping Bureaucrats’ Doyenne gin with lime, gazing out over the water. Walking to work again means lots of opportunities to see what is growing, and admire these lilies spotted in the Bolton Street Memorial Park. I’ve been monitoring the brambles growing through a neighbour’s fence. They have quickly ripened in the sun, and I could not resist tasting one of them – quite tart but edible. 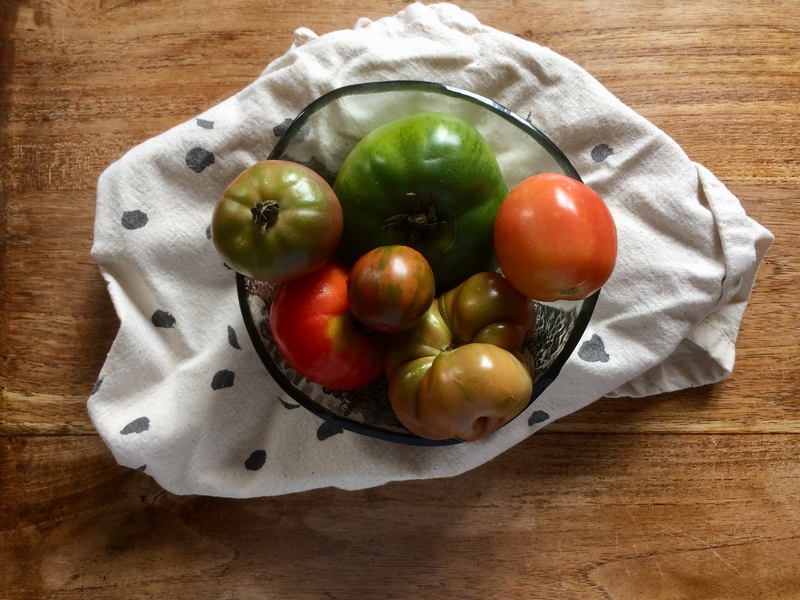 The featured image shows a bowl full of heirloom tomatoes, picked up with this week’s shopping. I can vouch that the one below on the left tasted good on toast! Oh lovely summer days with blue skies, lilies and tomatoes, one can but dream! yum! I think cherry tomatoes are one of my favourites. In different colours, roasted, and topped with feta and basil…. !